We are so so excited to be a part of an exciting fundraiser Small Hands Creating Hope for the American Cancer Society. Unfortunately most of us know someone who has been affected by cancer. In childhood, I heard about cancer first time when one of my favorite teacher's, 8 yr old kid got cancer. It was so hard to see him suffer and he died after a year. Next hit was when I was in college, one of my dad's close friend was diagnosed with liver cancer. After that here and there I have heard of cancer affected people and survivors too. Recently we heard about our property owner being diagnosed with Cancer. He is very active, kind person and we felt very sad for him. When we hear about cancer it passes lot of negative thoughts, Hope is the Positive Radiance and to keep moving in Life. Do check out the amazing story of MaryAnne at Mama Smiles! She was diagnosed with cancer at the age of 22 months and this year celebrating 30 years of being cancer free. Maryanne has joined hands with over 40 bloggers to produce the Small Hands Creating hope project. Each Blogger worked with their children or students to create a craft that could be made by or for someone facing cancer. MaryAnne at Mama Smiles has compiled the projects into an ebook. Are you Interested in getting a copy of the ebook, book! The book has several wonderful, amazing projects with tutorials for many and beautiful images. 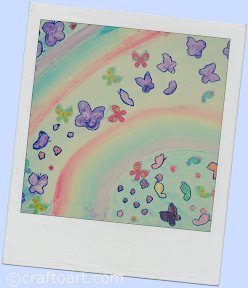 Our contribution to the small hands creating hope project is a Double Rainbow painting with Purple butterflies(Purple the color of hope). 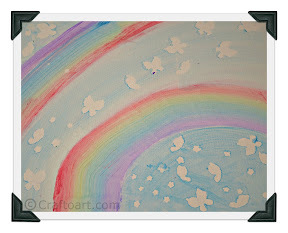 The art work can be made on canvas or as a card. We are hoping to raise $3000 by July 4th, and we are running a blog hop from May 14th until July 4th to celebrate and raise funds so that, in the future, thirty years of cancer free survivor will be the norm, not the exception! Learn about each of the bloggers who participated in the book by visiting each blog on their assigned dates – a few bloggers will be running celebratory giveaways, too! I'm so glad you participated in this project - thank you! Your contribution to such a noble cause is appreciable! Can I participate in this project and create an artwork too,to give my share of love and support? Hi Ritu! Thanks for stopping by! The project is already complete, I will let you know of similar projects henceforth! We are doing good sonia! We had been on a vacation and we are back now. Hopefully will be back blogging again soon! Thank you for asking. Hope you and your family are doing good!